FINAL CONSONANT DELETIONS BUNDLE- Save 30%! MINIMAL PAIRS & FINAL SOUND FLASHCARDS FOR FINAL CONSONANT DELETIONS- No Prep! DOT-TO-DOT FINAL CONSONANT DELETIONS- NO PREP & SUPER FUN TO DO! Hello and thank you for visiting Twin Speech, Language & Literacy. We have developed a bundle of NO PREP black-lined clip art resources for working on the common phonological process of final consonant deletions. It's a great quick print, easy to use bundle for helping all of your students struggling with the phonological process of final consonant deletions and articulation errors! ✌ The first resource is $6.00 and it is our, Final Consonant Deletions Black-Lined Minimal Pairs Flashcards. It contains minimal pairs flashcards that will hopefully teach your student to recognize that they have left a sound off of words. Place of articulation and how a sound is made can be worked on too. Not only that, we also included additional phoneme pages in this resource that target the B, CH, D, F, G, J, K, L, M, N, NG, P, S, T, TH, V, & Z sounds in the final position of words. ✌ The second resource is $7.00 and it is our, Dab-A-Dot Final Consonant Deletions resource. 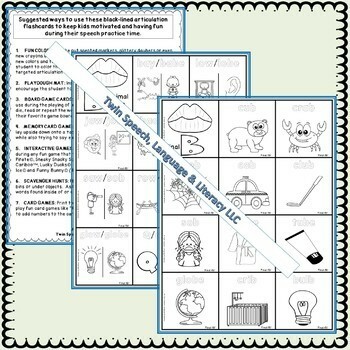 It's a super cute and fun packet that can be used over and over again with many different articulation students because it targets 19 sounds from /B/ to /Z/, but even more helpful is the fact that the worksheets have been specifically created to target those students who struggle with the common phonological process of final consonant deletions. ✌The third resource is $8.00 and its our, Dot-to-Dot Final Consonant Deletions resource. Dot-to-dot's are fun puzzles that kid's enjoy because in the end, they magically reveal the outline of an object. They are great because they help to boost a child's confidence, improve their counting, hand-eye coordination, motor skills, focus, and even strengthen their hand and finger muscles for writing. Your students will have fun completing the puzzles and they will get to work on one of the most common phonological processes! It's a WIN - WIN! 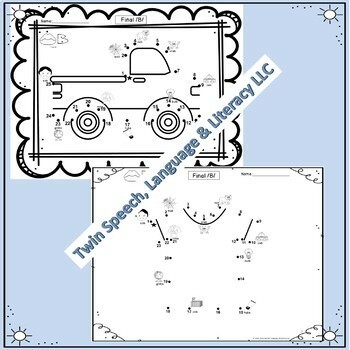 At Twin Speech, we like to save you a lot of money when you buy more than one of our products, so this bundle has automatically been marked down by 30%! It's a great way to obtain three useful resources at a discounted price right off the bat! If bought separately these products would total $21.00. Today you can receive all three for only $14.70. Please download the preview to see the contents of this bundle and sample pages for all three awesome resources. We want to make sure that you have a nice understanding of what you are buying before you do! ♥ Have a wonderful day!